Learn surfing, a sport that is dating back over 1000 years ago and remains a source of pleasure and excitement for many people until now. Supervised by the experts, you will progress at your own pace while having fun! Share your passion for surfing with Nature Surf Camp whilst protecting the nature of the earth. Situated just steps from one of the most "wild" surf spots 30 minutes from Hossegor, where Nature Surf Camp enjoys to take you every year. In the forest Landaise and in the lovely and very friendly village of Messanges. Accommodation is located in a wood-made construction equipped with every comfort for your stay, organized to make your holiday a unique experience. Located in a very peaceful neighborhood.There you can find two dorms, two double rooms, a three people room, with communal kitchen and sanitaries. And also a flat designed very well for family and friends with own bathroom and kitchen. Nature Surf Camp can welcome up to 15 people. There will be five surfing lessons that will last one and a half hour per session. Your lessons will be held from Monday to Friday. The timetables will be determined according to the tides and can change in accordance with the weather. You can surf alone after lessons and keep the gear. This also will be applicable to stand up paddle boarding session. For your best safety, you will go out at low tide and start learning to stand up on the board. You will be guided to understand and discover the ocean. For starters, you will learn to perform in this environment with or without a board. You will learn to read the beach and be able to identify the rips, currents, and sand banks. You will also begin to understand the notions of the weather forecast. The main aim is to get you independent while having fun and respecting the progress of each individual. If you already have experience in surfing, you will be given some remedial concepts. The aim of this course is to get you moving from foam blue wave so that you can perfect the basic and become the surfers. Video analysis and teaching adapted to the surf conditions will be provided for you. Benoit is 38 years old and has traveled mainly to Indonesia, Australia, New Zealand, Mexico, Nicaragua, Costa Rica, Canary Islands, and Sardinia. He got his experience from traveling and his 11 years of surf teaching on the Landes coast which will make him qualified to to teach surfing safely with his pedagogical and patient characteristics. Pacome is 36 years old and has explored South America, Mexico, Nicaragua, Peru, Equator, Costa Rica, and Australia. In addition to his travels, he is also a real surfing technician. He worked in workshops of famous French shapers so he will share this other aspect of surfing. He has been a surf and skate instructor for more than 8 years. His kindness and good mood will motivate you on the waves. You will stay at Nature Surf Camp situated near the ocean in one of the largest forests in Europe, with a framework that respects the environment. Nature Surf Camp is located on the Atlantic Coast, close to Hossegor and Biarritz, Messanges. If you want to eat at the surf house, you can make use of a fitted kitchen and a barbecue outside. The kitchen will be at your disposal for all your meals. You can also choose to explore nearby restaurants, snacks, or pizzerias at an extra cost. Nature Surf Camp is located in Messanges (Les Landes), is about a five-minute drive from the beach and two minutes from town. Messanges is a small tipical village with many beach breaks similar to Hossegor without the crowd! Surf lessons and surf rentals are available at the camp. Extra surf lessons will be available for 32 EUR per person. You can book your flight to Biarritz Airport (BIQ). Nature Surf Camp can arrange transfer from the airport at an extra cost. You can take RDTL which will stop in Messanges and Vieux-Boucau, close to the surf camp. You can get a train to arrive at Dax Railway Station. There is transfer available at an extra cost. 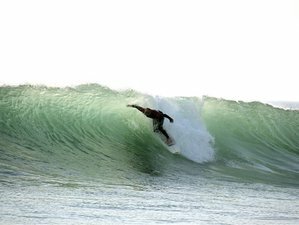 Nature Surf Camp offers surf courses with accommodation on the Atlantic coast in the South West of France. We offer different kind of course on a big property. Please note that extra nights are available for booking for 30 EUR per night per person. You may request a shorter or longer stay according to your preference. For more information, kindly send Nature Surf Camp an inquiry.